On Top of the World is one of the most well-known 55+ communities, but that doesn't mean it's not affordable. It’s entirely possible that Ocala is one of Florida’s best-kept secrets, especially when it comes to active adult living. Not only are you situated in Central Florida, within easy driving distance of Gainesville, Orlando, Daytona Beach, and Tampa, you’re also close to some of Florida’s most wild and natural parks, lakes, and springs. Imagine horse farms and towering cypress trees as well as gentle hillsides rolling through the landscape of an otherwise flat and swampy state. If you’re looking for an affordable place to live that isn’t along the crowded coastline, consider these 55+ communities in Ocala. A collection of 880 single-family homes, Pine Run Estates in Ocala is close to golf courses and freshwater lakes that make great spots for fishing and boating. Buyers in this 55+ community can purchase resale homes in several models ranging in size from a two-bedroom home under 900 square feet to a three-bedroom with 1,456 square feet of living space. There’s both the main clubhouse and a secondary clubhouse, where residents have a fitness center, pools, tennis courts, shuffleboard, and game rooms. Aerobics and Aquacize classes meet regularly, and there are holiday parties and potlucks to enjoy. Other activities include a horseshoes club, a singles club, and Bingo. Buyers looking for an affordable 55+ community on a golf course should consider Oak Run. This Ocala neighborhood is comprised of 3,509 single-family and attached homes. Duplexes have two or three bedrooms and range in size from 1,049 square feet to 1,489 square feet. The single-family homes are available in 20 different models and floor plans, with up to 2,275 square feet of living space. There’s an option to purchase a golf membership or a social membership at Royal Oaks Golf Club, which includes 18 holes of championship golf, a restaurant, and a pro shop. Amenities outside of the golf clubhouse include pools, tennis courts, and fitness centers. Residents participate in a long list of activities and clubs, including yoga, table tennis, gardening, and theater. For a low-maintenance lifestyle, Marion Landing is a 55+ community for discerning active adults to consider. For a low monthly fee, the HOA takes care of everything from exterior maintenance to water and sewer bills. Amenities and common spaces are also well-maintained. There are 600 single-family homes at this community, and they range in size from 864 square feet to 2,400 square feet. Properties are available to new buyers on a resale basis, and there’s R.V. parking on-site. The Lifestyle Center provides residents with fitness classes in the exercise room and events in the ballroom and the craft room. There’s an eight-lane bowling alley included as well, and a fishing pond. Residents enjoy shuffleboard, line dancing, and weekly social events. 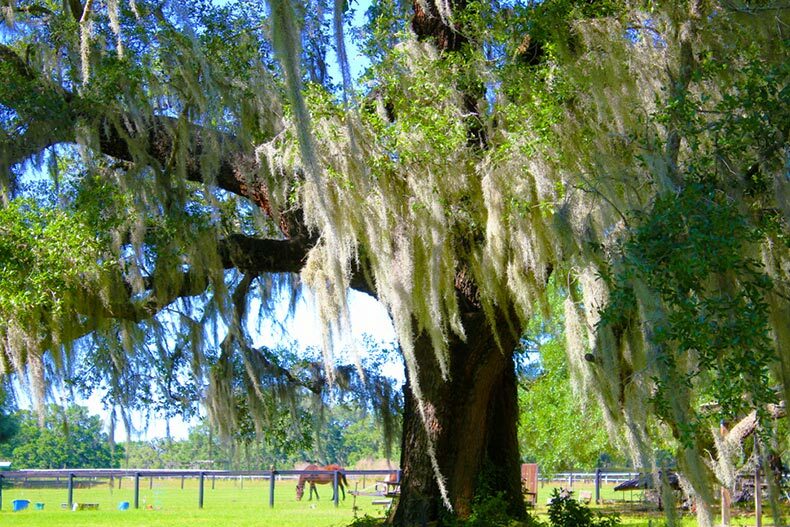 An oak tree with Spanish moss standing over a horse farm is a common sight in Ocala. Active adults love living at SummerGlen because of its wealth of amenities and its reasonably priced single-family homes. This 55+ community is gated and built around the SummerGlen Town Center and an 18-hole golf course. Over 1,000 properties are divided into the Arbor Cottage Series, Designer Series, and Signature Series. Choose between two and four bedrooms in floor plans that start at 1,377 square feet and go up to 2,575 square feet. Amenities include the SummerGlen Grill restaurant, a clubhouse with a lounge and a catering kitchen, and R.V. parking. There’s shuffleboard, bocce ball, horseshoe pits, and a softball field. Residents can wander around the scenic ponds or participate in activities like the travel club, cooking classes, or basketball. There’s a pool, a water aerobics class, and numerous social outings. One of the newest 55+ communities to enter the Ocala market is JB Ranch. This property is selling now for active adults interested in affordable, low-maintenance living in single-family homes. There are 346 new homes planned in several open floor plans. The clubhouse is still in development and will include a fitness center and a multi-purpose room. There’s a large outdoor pool area planned, with a patio and extensive trails for walking and biking. Residents can enjoy scenic parks and lots of open, natural space. The community is close to shopping, recreation, and the Munro Regional Health Center. The College of Central Florida is also a few miles away and a great place for further learning. On Top of the World might be the most well-known and award-winning 55+ community in Ocala but that doesn't mean it's unaffordable. In fact, this popular community has plenty of homes available for under $100K. Even for the homes available between $100K and $200K, of which there are plenty, these maintenance-free, single-family homes and attached villas don't skimp on features. 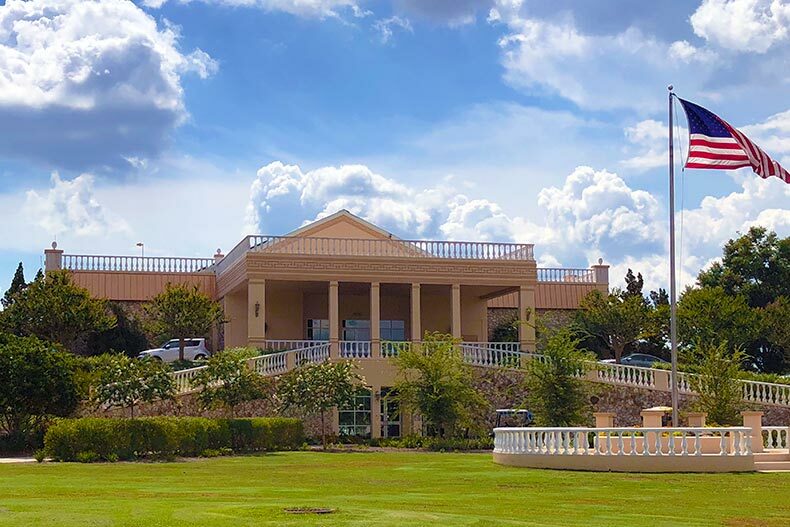 The community features several clubhouses, three 18-hole golf courses, fitness centers, swimming pools, tennis courts, restaurants, and even an R/C airplane field and R/C car track. Residents also have access to more than 200 clubs, meaning residents here rarely, if ever, get bored. The Commons provides plenty of conveniences just a golf cart ride away, including an ice cream shop, deli, and weekly farmer's market with fresh locally grown produce.